Archivists at the Dumbarton Oaks Research Library and Collection are currently processing the papers of Robert L. Van Nice and blogging about the process. Robert L. Van Nice undertook an extensive architectural survey of Hagia Sophia between 1937 and 1985. His collection includes fieldwork materials, architectural drawings, and photographs, and some of these have been digitized and posted to the blog. The current exhibition at the Graham Foundation, Anne Tyng: Inhabiting Geometry, explores the work of one of the first women to ever receive a fellowship from the Foundation, as well as one of the first women to receive a Masters of Architecture from Harvard University. This exhibition presents the work of the visionary architect and theorist Anne Tyng. Since the 1950s, when she worked closely with Louis I. Kahn and independently pioneered habitable space-frame architecture, Tyng has applied natural and numeric systems to built forms on all scales, from urban plans to domestic spaces. The exhibition will be on view in Chicago until June 18, 2011 at the Graham Foundation. looks at such ubiquitous and abundantly available urban elements, or “attractions” that are perpendicular to the road: doors, roofs, windows, lobbies, stairs, or walls. The exhibition examines how these can become protagonists, which, if exaggerated, over-extended, or misused, can form the urban between structure and situation. was set up to create a link between Lehnerer’s work as practicing architect and urban designer and his academic role in the same fields. Alex Lehnerer will give a free Artist Talk in conjunction with the exhibition on Tuesday, April 12th at 6pm. The “First Friday,” April 1st, marks the unofficial opening of the show. UBS 12 x 12 is a program at the MCA designed to feature new work by new artists. An archive of past exhibitions is available here. The project Montada seeks the preservation and revitalization of traditional architecture… in the Maghreb by involving local communities, especially children. Toward that goal, it is developing online games that allow children from 6 to 11 years old to discover the basic principles of a traditional architecture while developing their creativity. …A new game acts as a virtual workshop that allows children to explore geometric elements and ornaments in the homes of Sale and Marrakech, in Morocco. After finishing, children can print out their results as postcards. With a database of images, texts, charts and historical maps, Mapping Gothic France lets you explore parallel stories of Gothic architecture and the formation of France in the 12th and 13th centuries, considered in three dimensions: space, time, and narrative. Via Geospatial Technologies in Education. 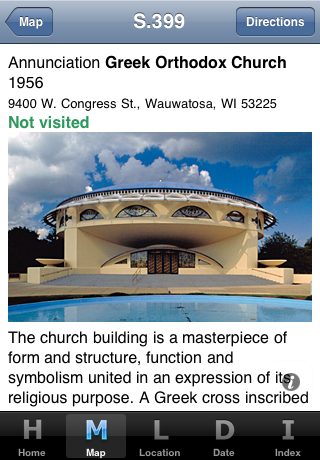 The new Wright Guide, developed by Azara Apps and adapted from William Allin Storrer’s The Architecture of Frank Lloyd Wright, offers descriptions and a photograph of each of the built works by Frank Lloyd Wright. Building descriptions link to other nearby architecture as well as to directions from the user’s current location. Buildings may be searched through the index or by browsing location or date. Users can even keep track of which buildings they’ve visited in the application. The app is $9.99 and compatible with iPhone, iPod touch, and iPad with iOS 3.0 or later. It is available from the iTunes store. For a demonstration of the kinds of products manufactured with this technology see the video included in the NYT story. Now you can (virtually) tour the Sistine Chapel via your computer screen, thanks to a project from Villanova University of Pennsylvania. Created in consultation with the Vatican, this QuickTime Virtual Reality (QTVR) tour of the Sistine Chapel facilitates study of the frescoes and architecture in a new way. 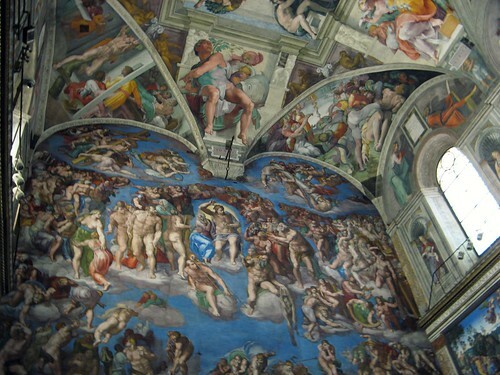 “Villanova students and faculty from the University’s communication and computing science departments spent five nights in a closed Sistine Chapel, gathering images from every corner of the chapel, including Michelangelo’s famous artwork on the chapel ceiling and large fresco, The Last Judgment, on the sanctuary wall. This was the most extensive access ever granted by the Vatican to an outside group.” For more information, see the press release from Villanova University. ArchNet is very happy to announce a new collection of rare Swahili Kingdom images in its Digital Library, the James de Vere Allen Collection. At present, this collection includes 185 black & white images of the Palace at Gedi, the Great Mosque of Gedi, the Kongo Mosque, the McCrindle house, and the Lamu cityscape, as well as other Kenyan sites. Sourced from Mr. Allen’s archive, which he donated to MIT in 1988, the online publication of these images was made possible with the kind permission of the family of James de Vere Allen.